The housing crisis dealt a blow to millions of Americans. As difficult as it is to lose a house, it’s important not to get swallowed up in negative feelings. The first step toward rebuilding your credit is to recognize that life throws curveballs, and we have to keep swinging to get on base. If you ended up in foreclosure, then it’s likely that either 1) you bought a house that was too expensive, the price cratered during the crisis, and other factors like job loss prevented you from making your payments, or 2) you took out a loan you really shouldn’t have, and got stuck in an asset you couldn’t afford. In either case, you need to rebuild your credit. The big question is what your credit looks like right now. First, you’ll want to get a look at your credit score. According to FICO, where you are now actually depends on what your credit was like before foreclosure. The higher your score beforehand, the harder it will be to restore. Hopefully, you had other credit lines that were in good standing before the house came down around you. 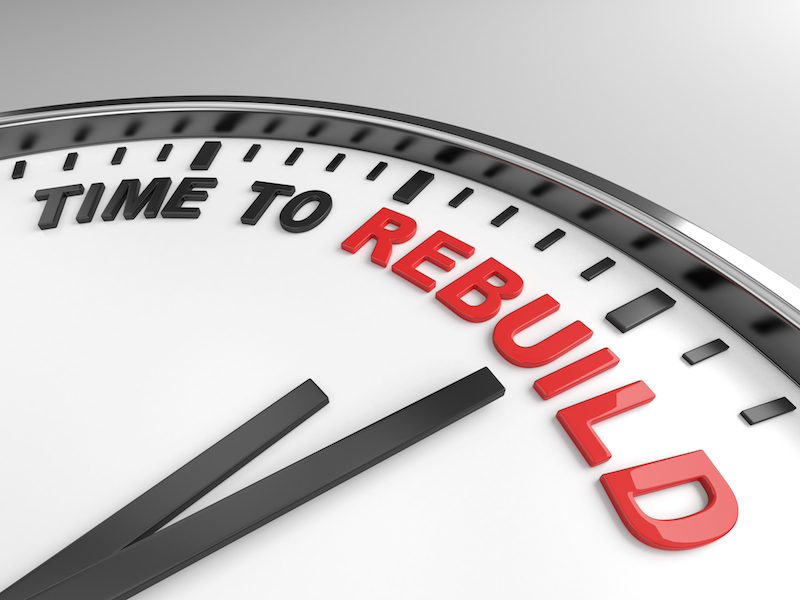 If so, you’ve got a great head start on rebuilding. Since 35% of your FICO score depends on payment history, and 30% depends on the amount owed, you’ll head in the right direction if you make your credit card payments on time, every time. Not only does that help your payment history, but it also will reduce your credit utilization rate, which makes up much of that 30%. Don’t apply for new credit, with the exception of secured cards. With these, you deposit money with the lender that it can draw on in the event of a default. Demonstrating responsibility with a secured card will help your score as well. Don’t cancel any credit cards. Since length of credit history makes up 15% of your FICO score, you don’t want to remove cards that are in good standing, and have been for a long time. Did you have a short sale or an outright foreclosure for non-payment? If it’s a short sale, and you had little to no deficiency to make up to the bank, it may take three years to restore your score. If it’s a foreclosure, the timeline is longer – it’ll take up to seven years. This is one of the worst parts of a losing a home — your credit will be dinged for some time to come. You are going to have to be very patient. Don’t let your frustration get the better of you to the point where you throw up your hands and stop paying on everything. If you took out that mortgage with no real idea if you could truly make good on it, you may need to re-evaluate how you use credit. This article is a good place to start if you want to improve your credit habits. If your habits have already improved, this article will help keep you from backsliding.